Neither the White House nor the Trump Organization has responded to interview requests. "Today, the GSA OIG confirmed what we all knew: The Trump Administration is in violation of the Emoluments clauses of the United States Constitution," said Rep. Gerry Connolly, D-Va., in a statement. "GSA's decision to not consider whether the President's business interest in the Old Post Office lease might be unconstitutional has enabled the President to line his pockets." The emoluments clauses have produced several lawsuits during Trump's presidential tenure. One of the lawsuits advancing through the legal system is from the attorneys general of Maryland and the District of Columbia, who argue Trump is illegally profiting off his presidency. Subpoenas in that case went out last month. "If 'emoluments' include an official's gains from private business activities, the President's interest in the lease raises at least potential constitutional issues. The Foreign Emoluments Clause becomes relevant if the hotel receives payments from or on behalf of foreign governments, or a foreign instrumentality, when its representatives stay or hold events at the hotel or otherwise use its services," the inspector general's report finds. 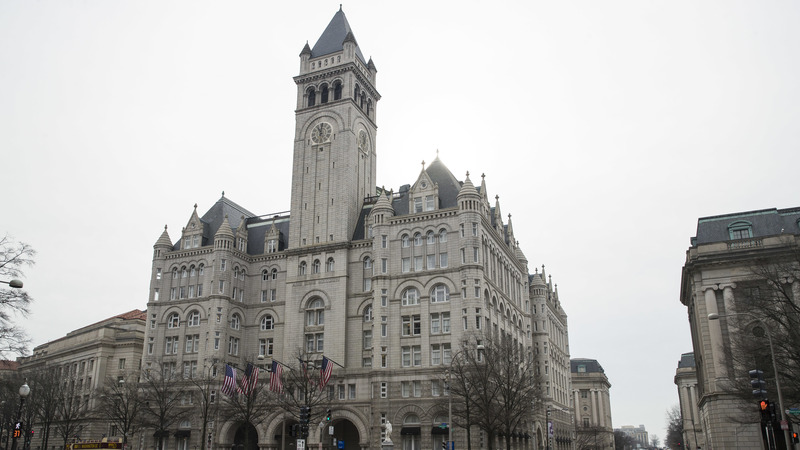 "The Presidential Emoluments Clause becomes relevant if the United States or a State of the United States similarly pays for the use of the hotel's services, or if Tenant receives other benefits from the government related to the hotel." The GSA inspector general recommends a legal review of the lease but stops short of suggesting it should be canceled. The Trump hotel has long been the center of scrutiny, as lobbyists, conservative allies and foreign officials frequently hold events there, raising questions about whether they are using the president's business — which he still profits from — as a way of currying favor with his administration. A Washington Post story on Wednesday found that T-Mobile booked several rooms there for its top officials as they were seeking Trump administration approval of its $26 billion merger with Sprint. And the historic clock tower in the building has remained operational with park rangers staffing it even as most other such historic sites have been shuttered during the continuing government shutdown.